World class professional surfing returns to East London for the first time in a decade when the inaugural Buffalo City Surf Pro presented by Reef Wetsuits runs from Saturday to Easter Monday, 15-17 April, in the challenging waves of Nahoon Reef. An exceptional field of 128 of South African and international surfers will battle for titles, a share of the R80,000 prize-purse and points on the regional and international rankings in the World Surf League (WSL) Qualifying Series (QS) rated events for Men and Women and Junior Qualifying Series (JQS) events for 18-and-under Men and Women. The Buffalo City Surf Pro is the second of five events in the City Surf Series, an exciting new tour that started in Port Elizabeth last weekend and after East London will also visit Durban and Cape Town. Michael February (Kommetjie), currently No. 35 on the QS rankings, is the top seed for QS1,000 rated Men’s event this weekend, and will be going all out to capitalise on his confidence boosting victory at the last stop to climb higher even higher on the international rankings and extend his early lead in the chase for 2017 WSL Africa Men’s title. Among the 64 men standing in his way are last week’s runner-up Dylan Lightfoot (Jeffreys Bay), 2016 WSL Africa champion Beyrick de Vries (uMhlanga), Americans Nate Dorman and Austin Neumann, Kelly Norris (AUS) and vastly experienced hometown hero and Nahoon Reef expert, Greg Emslie (East London). Australian Tayla Hanak heads the line-up for the QS1,000 Women’s event and in her first visit to East London faces strong opposition from former WSL Championship Tour (CT) competitor Nikita Robb (East London), whose knowledge of the waves of Nahoon Reef is unsurpassed in the 24 strong entry. The likes of Emma Smith (Jeffreys Bay), Nicole Pallet (La Lucia) and Teal Hogg (uMhlanga) will be determined to pocket as many points as possible so they can qualify for the big international women’s events overseas, while the effervescent Crystal Hulett (St Francis Bay) will be hoping to repeat her title winning achievement last weekend and hold onto the Skullcandy striped vest worn by the rankings leader. With points on offer towards the selection of the WSL Africa squad that is invited to compete in the World Junior Championships in Australia next January, the JQS1,000 men’s and Women’s events will be fiercely contested. Jake Elkington (Kommetjie), reigning WSL Africa junior champ Adin Masencamp (Strand), Sebastian Williams (Durban) and Luke Slijpen (Cape Town) are the junior men’s favourites, but local standouts Bryce du Preez and Luke Malherbe hold the aces in their home surf. Sophie Bell (Salt Rock) will be fully committed to re-establishing her dominance of the junior women’s rankings but 13 year-old Durban phenom Kayla Nogueira has been on a roll, taking out five titles in recent weeks, and currently tops the rankings. Kirsty McGillivray (Jeffreys Bay) and Taghiti Gericke (Wilderness) complete the top four seeds. Organisers will meet at Nahoon Reef early on Saturday morning and the decision on when to get the contest underway will be made at 7.30 am. The 16 heats in the Men’s event will be first up, followed by the eight heats in Round 1 of the Junior Men. Round 1 of the Women’s event is on standby for a possible start later in the day. The event champions will be crowned on Monday afternoon. An outreach programme conducted by Surfing South Africa (SSA) at Nahoon Beach on Easter Monday morning will feature 60 young surfers from the Unstressed Surf School in Cintsa and Waves 4 Change. The participants will be involved in beach activities, water coaching, a tag team contest, beach relays and an Easter egg hunt with all participants receiving breakfast, lunch and a commemorative medal. The programme will be run by SSA Development Officer Danielle Johnson and her Swot team to highlight transformation projects in the Buffalo City district and is supported by the Buffalo City Surf Pro, Reef Wetsuits, Volkswagen and the National Lotteries Commission. Live scoring, results, images, news and more for the Buffalo City Surf Pro presented by Reef Wetsuits will be available at WorldSurfLeague.com and on the WSL App, with highlights on the WSL QS Facebook, Twitter and Instagram accounts. The Buffalo City Surf Pro is supported by Reef Wetsuits, Volkswagen, Corona, the Buffalo City Municipality, Yesman, Tsogo Sun, Skullcandy, El Jimador and Accelerate Sport. Surfing South Africa is recognised by the Department of Sport and Recreation as the national governing body for the sport. Surfing South Africa is a member of the SA Sports Confederation and Olympic Committee (SASCOC) and the International Surfing Association (ISA). The inaugural Nelson Mandela Bay Surf Pro presented by Billabong wrapped up three days of high performance surfing action on Sunday with Michael February (Kommetjie) and Crystal Hulett (St Francis Bay) taking out the Men’s and Women’s titles respectively while Jake Elkington (Kommetjie) and Kayla Nogueira (Durban) clinched the Junior men’s and Women’s crowns. The first internationally rated World Surf League (WSL) Qualifying Series (QS) events to be staged in Port Elizabeth enjoyed contestable and testing surf for the three days and featured 128 competitors, including South Africa’s top exponents and entrants from the USA and Australia. February demonstrated why he is country’s highest ranked QS surfer by dominating throughout, leaving his opponents in combination situations and needing to replace their best two scores at the end of heats, including the Men’s final. Surfing with unparalleled speed, power and flow, the 23 year-old Capetonian effortlessly connected long rides all the way to the beach, cruising over flat sections and performing powerful manoeuvres when ever the opportunity presented itself. Fellow QS campaigner Dylan Lightfoot (Jeffreys Bay) kept pace for the first half of the 25 minute final, but an excellent 8.67 by February late in the heat left Lightfoot, third placed Jarred Veldhuis (Kommetjie) and fourth placed Beyrick de Vries, the 2016 WSL Africa champion, all requiring 16.01 points for victory. “Super happy with that result. I haven’t won an event for a couple of years and that’s my first QS1,000 event title,” said February. “The final was tricky, the waves were really far out and you couldn’t hear what the situation was, but after I’d had two decent rides I stayed close to Dylan (Lightfoot) and Jarred (Veldhuis) and used my priority to keep them off the good ones. February pocketed R10,000 and 1,000 coveted rankings points that will see him vault from 91st into the top 40 on the QS leaderboard and he will wear the Skullcandy zebra striped ranking leader’s vest at the next event on the City Surf Series in East London next weekend. Hulett, who scraped into the women’s final after losing half of one of her scores when she incurred an interference penalty in her semifinal match-up. But the youngest competitor in the last four went on to defeat her more experienced rivals, posting the highest score of the encounter, a 7.67 out of 10, before adding a mid-range 4.27 to clinch her first WSL QS event title. The Junior Men’s final was dominated by the Elkington brothers from Kommetjie, with younger brother Max leading until the last minute when Jake rdoe the highest scoing wave of the final to grab victory. “I got that 7.23 in the last 30 seconds and I was really stoked to overtake Max and get my first WSL Junior title,’ said Jake. ‘I gives me the early lead in the WSL Africa junior rankings and will hopefully help me to secure a place in the squad for the WSL World Junior Championships in Australia in January. The win has really given me confidence and I’m looking forward to East London next weekend. 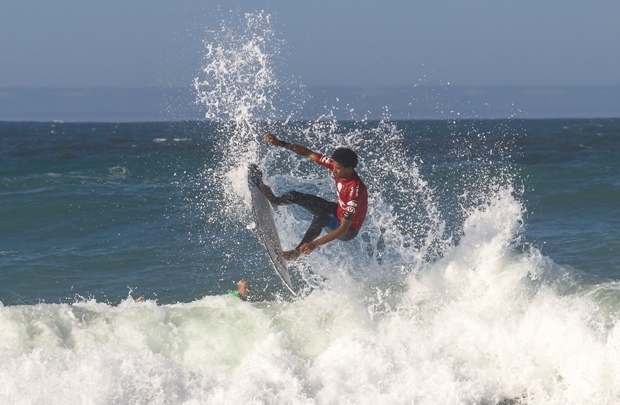 Nogueira has been on roll for the past three weeks with the 13 year-old Durbanite surfing to victories winning both the U14 and U16 titles on successive weekends before capturing the18-and-under title today. She stuck to her strategy and made sure that she caught to waves that gave her the opportunity to score a pair of five point rides. The winners were presented with their trophies and cheques by Athol Trollip, the Mayor of the Nelson Mandela Bay Municipality, Athol Trollip. The Mayor also presented special commemorative trophies to the 2016 WSL Africa champions Beyrick de Vries (uMhlanga), Faye Zoetmulder (Cape St Francis), Adin Masencamp (Strand) and Sophie Bell (Salt Rock). More than 50 excited youngsters had the time of their lives at the event today as part of a Surfing South Africa Outreach initiative that saw them participate in a Tag Team surfing event and a coaching clinic, as well as relay races and an Easter egg hunt at the beach. Run by SSA Development Officer Danielle Johnson and SSA Event coordinator Shirley Fairall, the participants came from Missionvale, Motherwell and Jeffreys Bay and were supported by Volkswagen and the National Lotteries Commission. Results, images and video footage from the Nelson Mandela Bay Surf Pro will be available on www.WorldSurfLeague.com and on the WSL App, with highlights on the WSL QS Facebook, Twitter and Instagram accounts. The Nelson Mandela Bay Surf Pro presented by Billabong is supported by Volkswagen, Corona, the Nelson Mandela Bay Municipality, Yesman, Tsogo Sun, Skullcandy, El Jimador and Accelerate Sport. Surfing South Africa is recognised governing body for all disciplines of surfriding in South Africa by the Department of Sport and Recreation. SSA is a member of the South African Sports Confederation and Olympic Committee (SASCOC) and the International Surfing Association (ISA). Michael February produced a sensational performance at the Nelson Mandela Bay Surf Pro presented by Billabong in Port Elizabeth today, starting his quarterfinal heat with an excellent ride of 9.57 and then backing that up with the first perfect 10 point ride of the event for a near perfect heat tally of 19.57 out of 20. While February (Kommetjie), the top seed in the QS1,000 rated Men’s event, was the day’s star performer, Women’s top seed Nicole Pallet (La Lucia) also stood out by delivering two rides in the excellent category (over 8 points out of 10) for a 16.50 heat total, while Luke Slijpen (Cape Town was the top points scorer among the Junior Men. February was joined in tomorrow’s first semifinal by fellow Kommetjie residents Jordy Maree and Jarred Veldhuis, along with Brandon Jackson (Durban North). The second semifinal will be determined after the remaining two quarterfinals are completed on Sunday morning. Pallet, who spent a month in Australia earlier this year competing in WSL events, overcame her nervousness about the conditions and the ability of her opponents to record the best return in the Women’s event by getting an early mid-range score before racking up her pair of eight plus rides. “I was pretty nervous before the long paddle out because the waves were really messy and I had Australian Tayla Hanak in my heat,” said Pallet. “I had one ride and then my coach Quintin Jones put me in good spot and I caught that right that gave me an 8.33. Then Sophie (Bell) just missed one and I caught it further in and I managed to get an 8.17. Pallet faces Hanak again in the semifinals, along with 2016 WSL Africa women’s champion Faye Zoetmulder (Cape St Francis) and Tarryn Chudleigh (Cape Town). The second semifinal includes Teal Hogg (uMhlanga), Crystal Hulett (St Francis Bay), Tasha Mentasti (Durban) and Emma Smith (Jeffreys Bay). The Junior Men’s event was dominated by Slijpen who delivered the two highest scores of 14.83 in Round 1 and 15.10 in the quarterfinals to advance to the semis. Others to shine in the JQS1,000 rated event for surfers 18-and-under included Koby Oberholzer (Warner Beach), Calvin Goor (Salt Rock) and Sebastian Williams (Durban). The opening round of the Junior Women’s event was held over to Sunday and will be run before the semifinals and finals of all the events sees the champions crowned at the event site. The Mayor of the Nelson Mandela Bay Municipality, Athol Trollip, will present the winners with their trophies and cheques. He will also present special commemorative trophies to the 2016 WSL Africa champions Beyrick de Vries (uMhlanga), Faye Zoetmulder, Adin Masencamp (Strand) and Sophie Bell (Salt Rock). Organisers will meet at Pollock Beach at 7.15 am local time on Sunday to make a call on when to get the contest underway, with a 7.30 am start anticipated. The top seeded surfers dominated proceedings in today’s opening rounds of the Nelson Mandela Bay Surf Pro presented by Billabong, the first of eight events on the South African Qualifying Series (QS) leg that will crown the 2017 WSL Africa champions in September. Organisers completed Round 1 and four of eight heats of Round 2 in the QS1,000 rated men’s event which was held in lumpy, wind affected but highly contestable waves that saw the 64-man field reduced to just 32. Top seed Michael February (Kommetjie) got his campaign underway with a hard fought second place in the first heat of the day, but made amends in Round 2 where he posted the highest scores for a single ride (9.33 out of 10) and for his heat total of 16.0 out of 20. Beyrick de Vries (uMhlanga), the 2016 WSL Africa champion and No. 2 seed, was wearing the Skullcandy WSL Africa rankings leader’s zebra striped vest in the first event of the year. De Vries made no mistakes in his opener, racking up an excellent 8.0 and a 6.33 to advance and he will be in the first heat when Round 2 of the Men’s event recommences. Only one of the seven internationally ranked surfers is still in the event. James Tyler (USA) is yet to surf his Round 2 heat while his compatriots Braden Jones and Austin Neumann progressed to Round 2 but were eliminated there. Other standouts on the opening day included Jason Harris (Durban) and Kommetjie residents Jordy Maree and Jarred Veldhuis, all three of whom won their Round 3 match-ups to reach the last 16. The men’s QS1,000 rated Nelson Mandela Surf Pro presented by Billabong offers a total prize-purse of R30,000 and coveted points on the regional and international rankings lists. Saturday’s second day will see action in the QS1,000 women’s event plus the JQS1,000 men’s and women’s events for surfers aged 18 and under. Organisers will meet at Pollock Beach at 7.15 am local time to make a call on when to get the contest underway, with a 7.30 am start anticipated. The most exciting and lucrative series of professional surfing events ever staged in South Africa will be launched in Port Elizabeth on Friday when the Nelson Mandela Bay Surf Pro presented by Billabong hosts a huge field of local and international competitors at The Pipe on Pollock Beach. Comprising World Surf League (WSL) Qualifying Series (QS) rated events for men and women, plus Junior Qualifying Series (JQS) events for men and women aged 18-and-under, the Nelson Mandela Bay Surf Pro offers a total prize-pool of R80,000 plus points counting towards international and regional rankings lists. The historic event has notched up a slew of landmarks including being the first professional surfing contest to be staged in the city; the first of five similar tournaments in the inaugural City Surf Series, which will also visit East London, Durban (twice) and Cape Town; the first of four JQS events in the 20th annual Billabong Junior Series and the first event counting towards the crowning of the 2017 WSL Africa regional champions in September. The QS1,000 rated men’s event features a 64 man field including the cream of South Africa’s surfers. The top seed is Michael February (Kommetjie), currently the country’s highest QS ranked surfer at No. 65, followed by 2016 WSL Africa champion Beyrick de Vries (uMhlanga), Dylan Lightfoot (Jeffreys Bay) and Braden Jones (USA). The men will be battling for a share of the R30,000 on offer with the winner pocketing R10,000 and 1,000 precious ranking points on the 659 man WSL QS leaderboard. The QS1,000 women’s seeding is headed by Nicole Pallet (La Lucia), Emma Smith (Jeffreys Bay), Teal Hogg (uMhlanga) and Fay Zoetmulder (Cape St Francis) with Tayla Hanak (AUS) the only international among the 24 competitors. Reigning WSL Africa Junior champion Adin Masencamp (Strand), Sebastian Williams (Durban) and Kommetjie residents Jake Elkington and Ford van Jaarsveldt are the top four in the JQS1,000 junior men’s event, while the JQS1,000 women’s field is headed by Sophie Bell (Salt Rock), Kirsty McGillivray (Jeffreys Bay), Taghiti Gericke (Mossel Bay) and Olivia Izzard (Umhlanga). The rankings points accumulated in the JQS events determine the top four men and top two women who will represent WSL Africa at the annual WSL World Junior Championships in Australia in January. The three day event starts with two rounds of men’s competition on Friday, followed by the earlier rounds of the women’s and junior events on Saturday and concludes with the champions being crowned on Sunday. Outreach programs designed to foster and encourage newcomers to surfing will be run during the event by Surfing South Africa, the national controlling body for the sport. Live scoring, results, photos and video footage will be available on www.World SurfLeague.com and on the WSL App, with highlights on the WSL QS Facebook, Twitter and Instagram accounts. The Nelson Mandela Bay Surf Pro presented by Billabong is supported by Volkswagen, Corona and the City of Port Elizabeth. 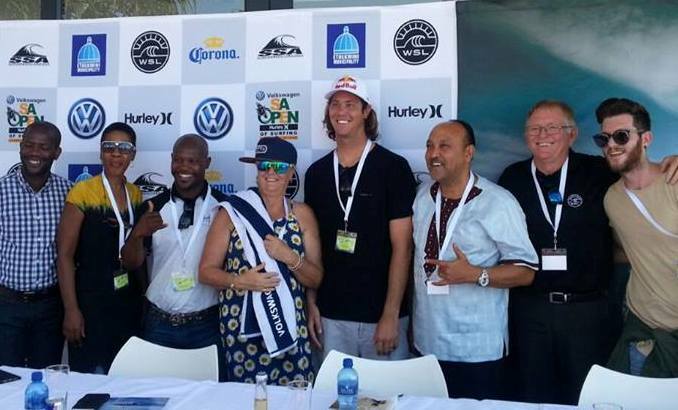 Africa’s best ever year for professional surfing was launched yesterday (Tuesday) when the 2017 WSL Africa schedule featuring 13 events totaling R13 million in prize-money was unveiled at a media function in Durban to announce the inaugural Volkswagen SA Open of Surfing presented by Hurley. Taking place at locations that range from Lamberts Bay on the West Coast to Durban on the East Coast, and including an event in Morocco co-sanctioned with WSL Europe, the schedule comprises events for men, women, junior (18-and-under) men and women and also incorporates outreach programmes designed to spread the stoke of surfing. The local events will be a huge benefit to South Africa’s current and future surf stars who will be able to accumulate prize-money and coveted World Surf League (WSL) Qualifying Series (QS) ranking points at their home breaks and without having to incur exorbitant international travel costs. The points will also qualify them for entry into the major events overseas. The season starts with the Nelson Mandela Bay Surf Pro presented by Billabong from April 7-9, the first WSL rated event ever to be staged in Port Elizabeth. Featuring QS1,000 rated events for men and women plus JQS1,000 rated events for junior men and women, the three-day tournament offers a total prize-pool of R80,000 and is the first of five events in the City Surf Series. Next up is the Buffalo City Surf Pro presented by Reef Wetsuits over the Easter weekend (April 15-17), where pro surfing returns to East London for the first time in a decade, and the Corona Durban City Surf Pro presented by Quiksilver (April 21-23), both offering the same format and prize-money as the Port Elizabeth event. May 20-21 sees the BOS Cape Crown presented by Billabong in Cape Town, the first of three stand-alone JQS1,000 events for junior men and women that include the Billabong Junior Series events at Ballito (June 27-29) and Cape St Francis (Sep 22-25). Points from these events will also count towards the 2017 WSL Africa Junior titles and selection of the four men and two women who will represent the region at the World Junior Championships in Australia next January. The second annual Vans Surf Pro Classic at Lamberts Bay (June 2-4) has added a QS1,000 women’s event to the men’s and junior men’s events this year before the focus moves back to KwaZulu-Natal for the inaugural Volkswagen SA Open of Surfing in Durban (June 14-18) where the men’s event carries a QS3,000 rating and a R1 million prize-pool alongside QS1,000 women’s and junior men’s and women’s events. Competitors in all four categories will be logging up the air miles as they return to Big Bay in Bloubergstrand for QS1,000 and JQS1,000 rated events in the Jordy Smith Cape Town Surf Pro presented by O’Neill (June 23-25) under the iconic landmark of Table Mountain. Then it’s back to the mid-winter warmth of KZN for the Ballito Pro presented by Billabong where the women’s event runs June 30 to 2 July and the R3.3 million, QS10,000 rated men’s event will feature 100 of the world’s best surfers from July 3 to 9. All of the world’s top 34 ranked surfers will be in action at Jeffreys Bay from July 12 to 23 in the newly named Corona Open J-Bay, the sixth of 11 stops on the Samsung Galaxy WSL Championship Tour, where they compete for a share of R7.5 million and ranking points in the race for the 2017 world surfing title. The final WSL Africa event for men and women is the co-sanctioned Anfa Place Casablanca Pro in Morocco from September 12 to 17 which offers QS1,500 rated events for both categories. “I’m proud and honoured that WSL Africa has now grown to the point where the country’s current and future surf stars can compete in locally based events and advance their careers by earning enough rankings points and prize-money to qualify for major events elsewhere without having to spend a small fortune chasing around the globe,” said long serving WSL Africa Operations Manager, Colin Fitch. The Cell C Goodwave, an invitational event that holds a one year waiting period for the best waves at New Pier in Durban, has received a specialty sanctioning from the WSL. The one day event offers a R100,000 prize-purse to the winning surfer. The five events making up the City Surf Series will each host activities coordinated by Surfing South Africa, the national controlling body for the sport, and run by the outreach projects in the various locations, designed to foster and encourage surfing among young people, regardless of their background.